We’d love your help. Let us know what’s wrong with this preview of The Nuts by Eric Litwin. In the third book of the Hazel Nut and Wally Nut's playtime roll down a muddy hill turns into a hilarious chase when they get covered in so much muck that they get bigger... and bigger... until they're big as ELEPHANTS! Can anyone help get the Nuts back down to size? Eric Litwin offers an upbeat and inspiring message: What do you do when you roll into trouble? Keep rolling! To ask other readers questions about The Nuts, please sign up. I channeled my inner "Tina Turner" to add fun to this wonderful read-aloud! The Nut family adventures are a favorite with my story time groups! Cute storytime book! Again, in the tradition of Pete the Cat. Bright, colorful pictures. As our nutty heroes get bigger, their size is compared to the sizes of cats, dogs, and elephants. The suggestive placement of branches and leaves and twigs cause a dog to chase them thinking they are "cats," a dog-c Hazel and Wally are nuts who are sick of being small. So they roll down a muddy hill, getting bigger and muddier as they go. Simple words to describe size (big, small, tall, etc.) are introduced and repeated. There's an easy refrain to sing: "Keep rolling. Keep rolling. Keep rolling." Another book from the author of the original Pete the Cat books, and it looks like he is creating a new series about nuts. This one has a simple song, perhaps a bit too simple. Overall, I prefer Pete the Cat and Groovy Joe. Another win for Eric Litwin. Hazel and Wally Nut want to be bigger, so they start rolling and picking up mud that changes their size. When they get bigger, they appear to be cats, then dogs, and then elephants, which brings about its own challenges. Great for PreK or Toddler Story Class. The "song" didn't do a whole lot for me. But at least the illustrations were cute, and the story was a silly one that kids will like. Except that the author tried to shoehorn a lesson in at the very end that didn't really fit with the rest of the book. This book has that musical and lyrical quality that kids really enjoy. I'm sure that parents will be sick of singing "Keep Rolling" after they have to read this for the 17th time but I think this will be favorite read aloud for little ones. The illustrations are charming too. A great choice for storytimes, my grandchildren loved this book! The illustrations are bright and colorful. The song refrain used throughout is a catchy tune and the narrator does a terrific job. This story is kind of weird- why would acorns roll themselves in mud to grow in size? Don't know. The message is good though: Keep rolling! "And that family was happy, even though they were small. Because when you have each other, then you have it all." Another fun book in the series. Young readers will like singing along to this one, as well. Be sure to listen to Eric Litwin and friends read and sing this story on his website. Seriously love this series! Such fun for everyone! This review has been hidden because it contains spoilers. To view it, click here. Great book for a theme based on being happy with who you are. Hazel and Wally are nuts that grow in size due to mud. "Keep rolling" a library storytime read. What even??!!! Please tell me the author was high af when he wrote this because otherwise I've got nothing. The same characters as the first book but no nut puns and not quite as sweet. Still cute surprises make it a delight. The magic that is Pete the Cat: I Love My White Shoes is not present in this tale. The song was meh, but the illustrations are cute! I like this way better than Pete. Short and sweet. Good mix of rhyme and prose. Book matter includes names of editor and designer. 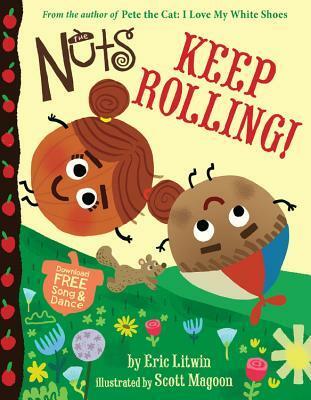 Another "nutty" book with a fun message. Focus group arriving in a few days and I'll see what they think of it ;-) Usually can't go wrong with stories about mud with small boys. The audio on line is great. Fun ode to kids who want to grow too fast. Lots of repetition so kids can get involved in the story if read aloud. I love how this book is about family, sizes and animals. A catchy refrain can be sung-this seems to be the best "Nuts" book yet. The illustrations are whimsical. I got this book from the amazon prime books for kids about two months ago. I read it to my son and he loved it. Nice little story about sibling nuts that want to be bigger. This book has lots of repeated elements and you could roll your arms for when the nuts are rolling. Cute!